This barber station is made to meet your needs and demands of your barber shop. 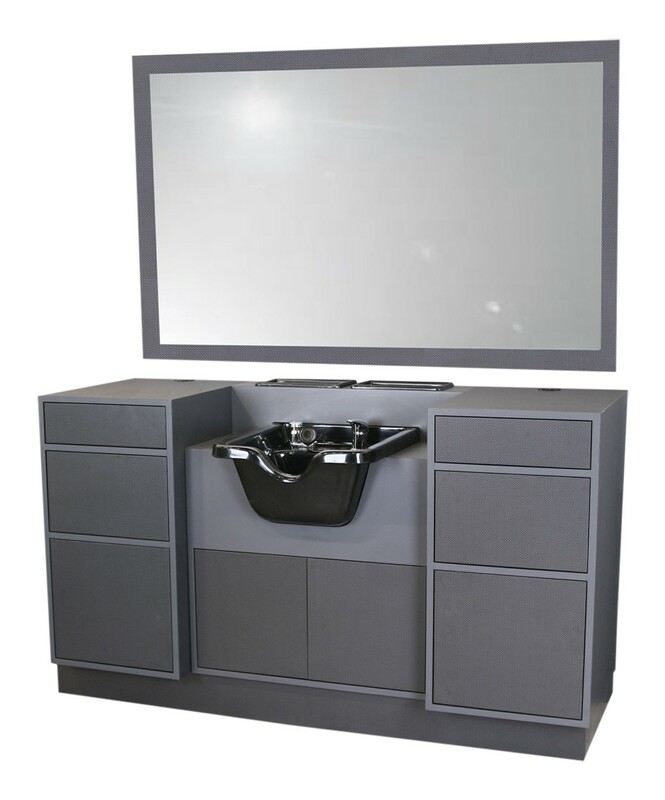 It featrures 6813 barber cabine, 6811 anchor cabinet with CB80 bowl, 6815 towel cabinet and 36 x 72 mirror ordered separately. Made in 45 different colors. This barber station is made to meet your needs and demands of your barber shop. 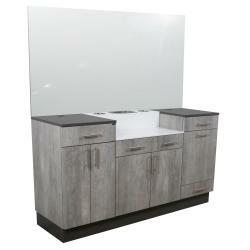 It featrures 6814 styling cabinet, 6812 Anchor cabinet, 6817 utility cabinet and 36 x 72 mirror ordered separately. Made in 45 different colors. This barber station is made to meet your needs and demands of your barber shop. 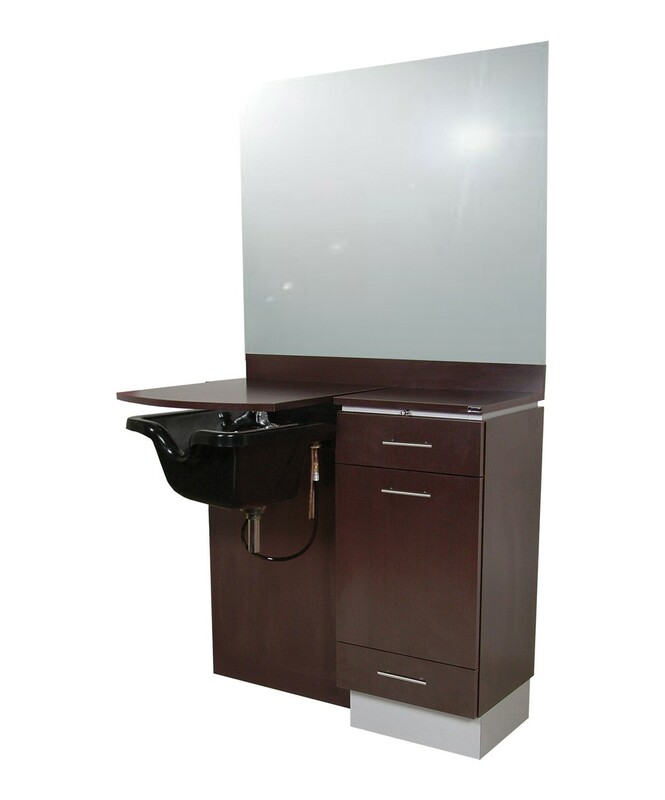 It featrures 6813 barber cabinet , 6812 Anchor cabinet, 6816 hand wash cabinet and 36 x 72 mirror ordered separately. Made in 45 different colors. 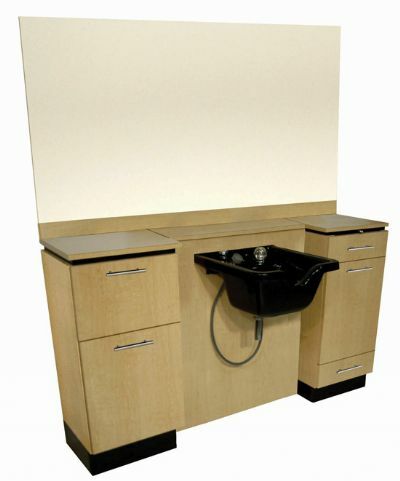 The Quinton barber station features a white solid surface counter-top, two drawers, two barbicide holders, two blow dryer holders, two clipper pockets, four clipper hooks and two quad electrical outlets. 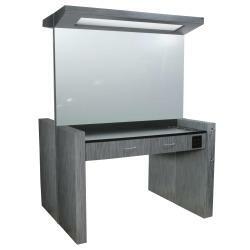 This station comes complete with the Quinton Soffitt with color-matched fluted molding and rosettes, T5 Fluorescent lighting, light switch, wire-chase, installation panels and a 36" x 60"" mirror. Available in 45 different colors." The Quinton back to back barber station features two identical units build back-to-back for two barbers, two-sided Quinton Soffit and inside wire chase and switches to be wired by an electrician. It includes two 36 x 60 full width mirrors. Available in 45 different colors. The Quincy features a white solid surface counter-top, two drawers, two barbicide holders, two blow dryer holders, two clipper pockets, four clipper hooks and two quad electrical outlets. 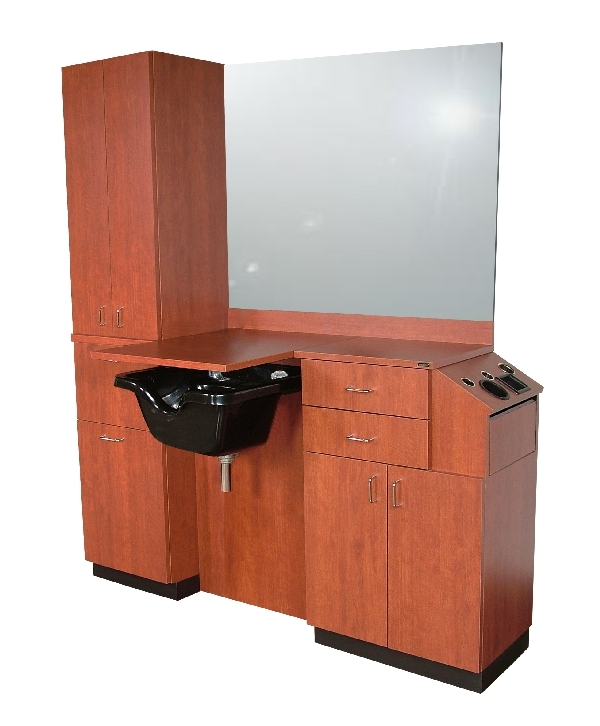 The Quincy barber station comes complete with the Quincy soffitt with color-matched fluted molding and rosettes, T5 fluorescent lighting, light switch, wire-chase, installation panels and a 36" x 60"" mirror. Available in 45 different colors." This barber station features two drawers, a barbicide holder, blow dryer holder, clipper pocket, two clipper hooks and a quad electrical outlet. 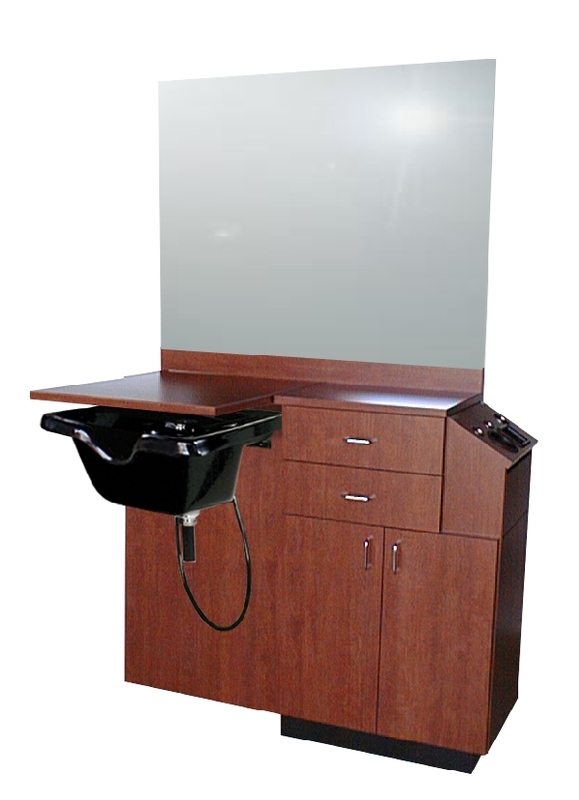 The Briggs Barber Station is very versatile and comes complete with the Briggs wall-mounted soffit with grate, T5 fluorescent lights and 60" x 36"" mirror. " The Briggs back-to-back station has two identical units built back-to-back for two barbers, two Briggs soffits, two mirrors 36x60, internal support wall with wiring chase and switches to be wired by an eletrician. Available in 45 different colors. The Bradford Dentil barber station is the upmost quality and craftsmanship in the salon industry. This station is accented with wood cusytom crown and dentil molding. This station features four drawers including a shear drawer, a breadboard pull-out and a fully equipped tilt-out barber tool panel. It come with CB-80 porcelain bowl and framed mirror. Available in laminate colors. This station is designed and built with functionality and durability in mind. 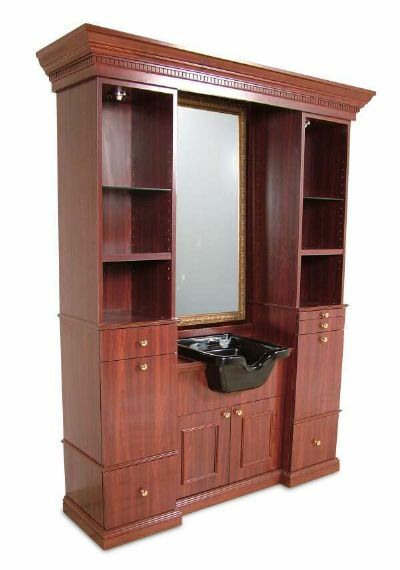 It is a fully-equipped barber station featuring real wood crown and molding. The Bradford offers a traditional style and includes a breadboard pull-out, 5 utility drawers and 1 shear drawer, three storage cabinets and tilt-out tool panel. Mirror is ordered separately. Available in laminate colors. 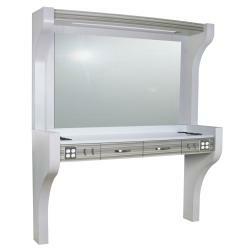 The Edge 6626-21 barber station come with CB19 shampoo bowl and framed mirror. Thecenter has a shampoo bowl, bottle well an plumbing access doors. It has let and right cabinets with two drawers and storage. 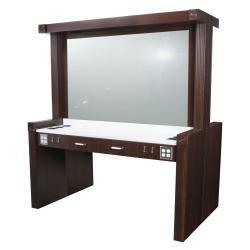 The framed mirror is aailable in both 66 inches and 72 inches widths. Available in 45 different colors. 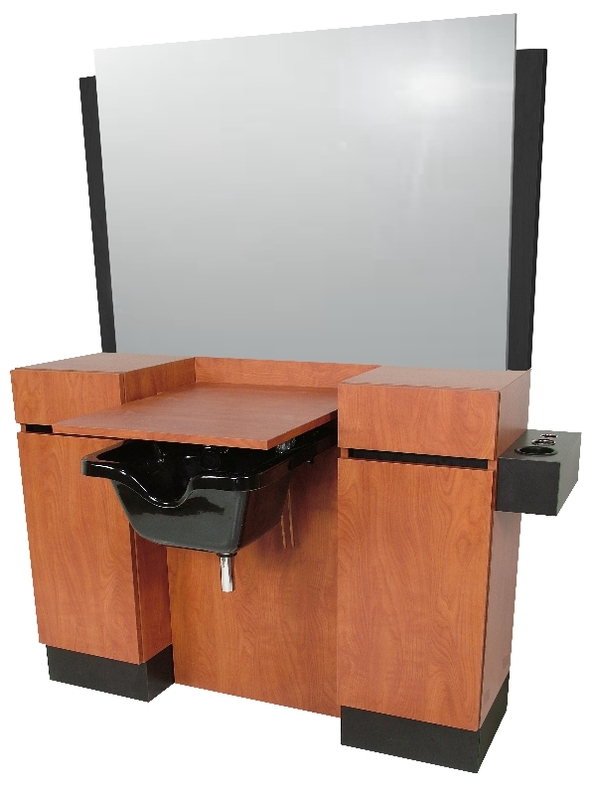 The Classic barber stationis functionality and style in one station! It features two drawers, two storage cabinets, soiled towel drop, fourplex electric, soiled towel drop and plumbing access doors. Available in laminate colors. 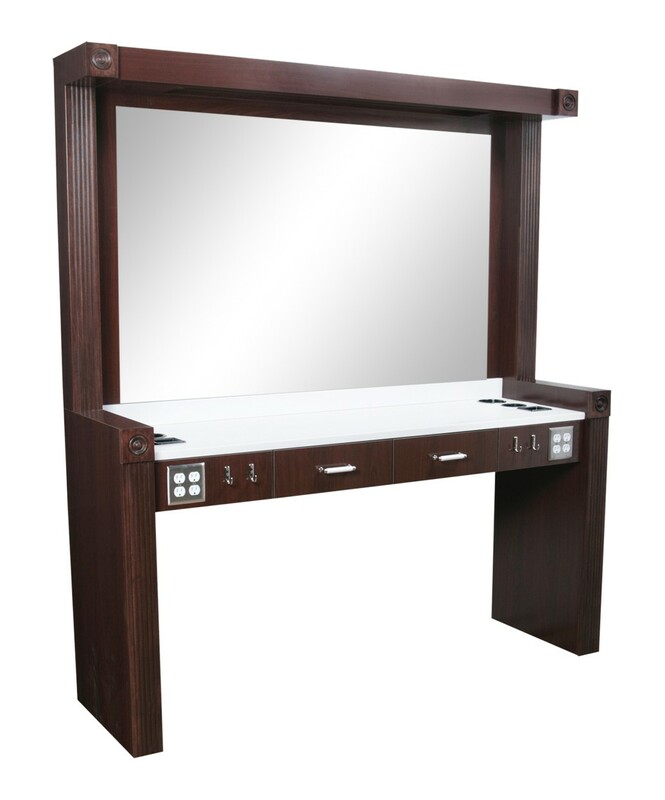 The Brentwood barber unit is a contemporary design, up-scale barber station for added elegance of you barber shop. This station features untraviolet sterilizer on one side of the mirror and a hot towel cabinet on the other, a large bottle well behind the shampoo bowl, barbicide, two clipper pockets, blow dryer holder, quad eletric on the side and hides plumbing. This QSE station is the perfect adition to your barber shop. It is fully equipped with two full extension drawers, two storage cabinets with shelves and a second set of cabinets to allow for plumbing access. It also has two clipper pockets and a blow dryer holder for your convenience! It includes a wall mounted mirror and a build-in CB19 ABS plastic shampoo bowl with vacuum breaker. Available in 10 QSE colors. 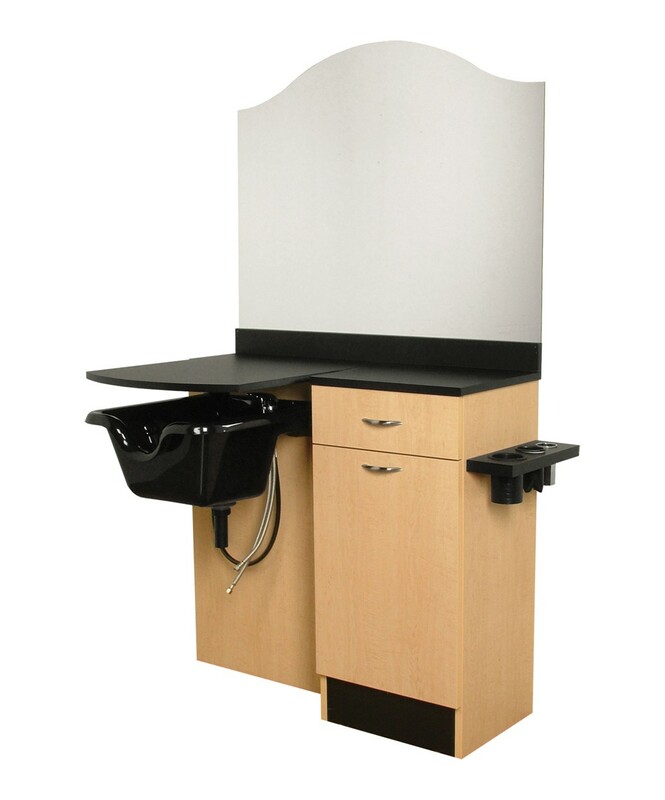 This deluxe barber station is the perfect solution to any shop or salon. 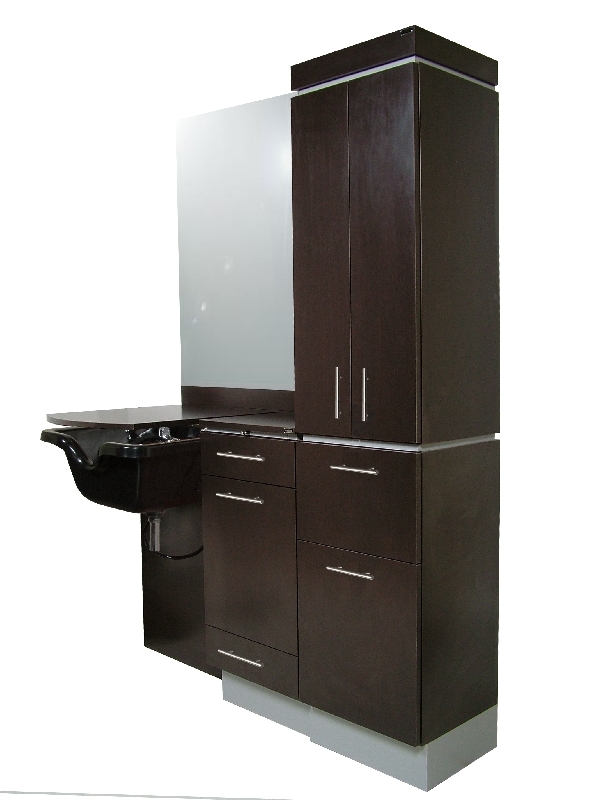 It features a double-door storage cabinet to the right of the sink, single-door storage cabinet to the left and two pull-out drawers on either side of the shampoo well. 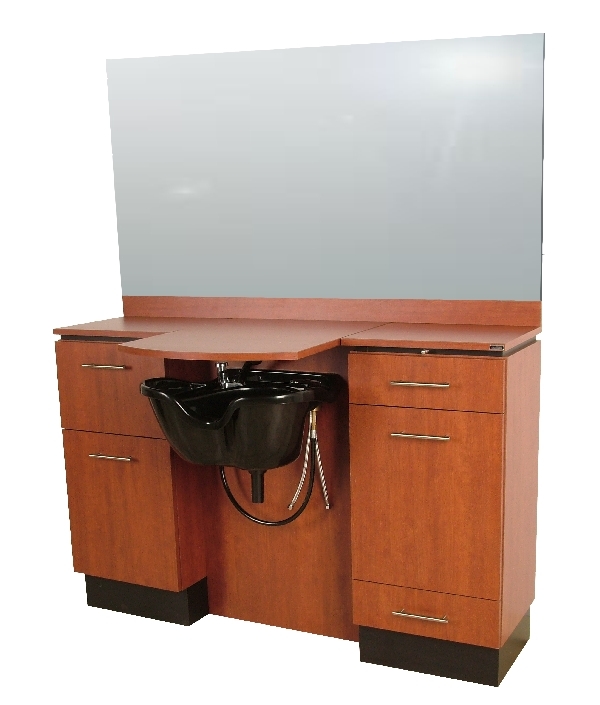 It includes a wall-mounted 36 x 60 mirror, fully equipped angled tool-panel, power strip, shampoo bottle well, a short lift-lid over the bowl and a 3 inches backsplash. Available in QSER laminate finish. CB19 shampoo bowl sold separately. 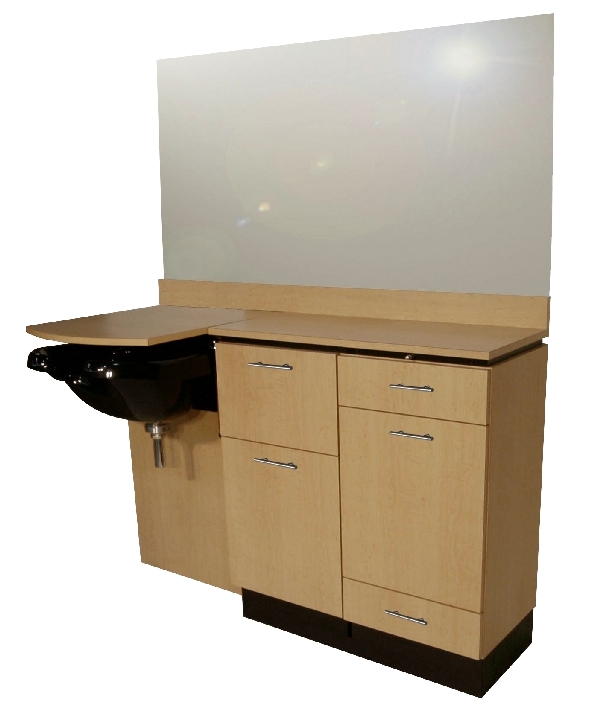 This barber station includes a wall-mounted 36 x 72 mirror, full-width 3inches high backsplash and bread-board pullout work area. It provides you with a fully-equipped tool panel, two drawers and a utility cabinet with tilt-out storage for clean towels. It also features a tilt-out soiled towel hamper (hamper included.) 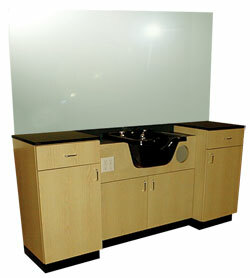 This unit also features a shampoo bowl bulkhead with a SHORT lift-lid and concealed bottle well. The CB19 Shampoo Bowl sold separately. Available in QSE laminate colors. The Old School barber station is sure to give your shop a stylish look! 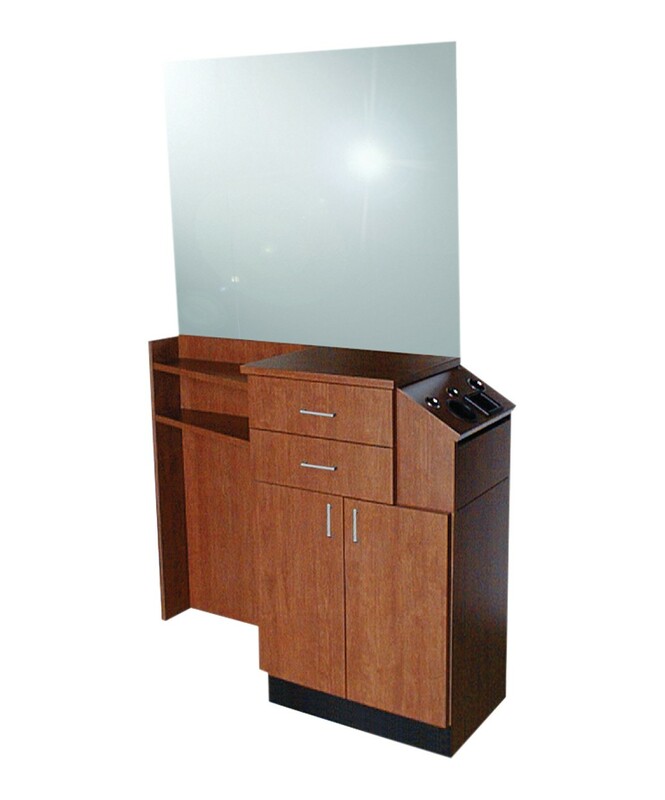 It features a glass surface counter-top, two drawers, four shelves, storage compartment, display shelves and mirror. This barber statiotn is available in laminate colors. The Barn barber station is sure to give your shop a stylish look! It features a beautiful counter-top, two drawers, built -in tool holder, a storage cabinet with door and mirror. 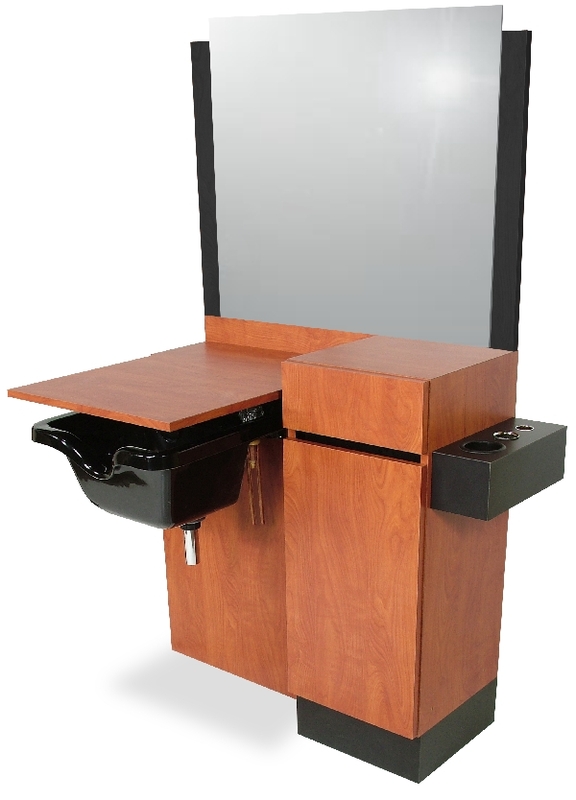 This barber station is available in laminate colors. Made in the USA. This barber station is sure to give your shop a stylish look! 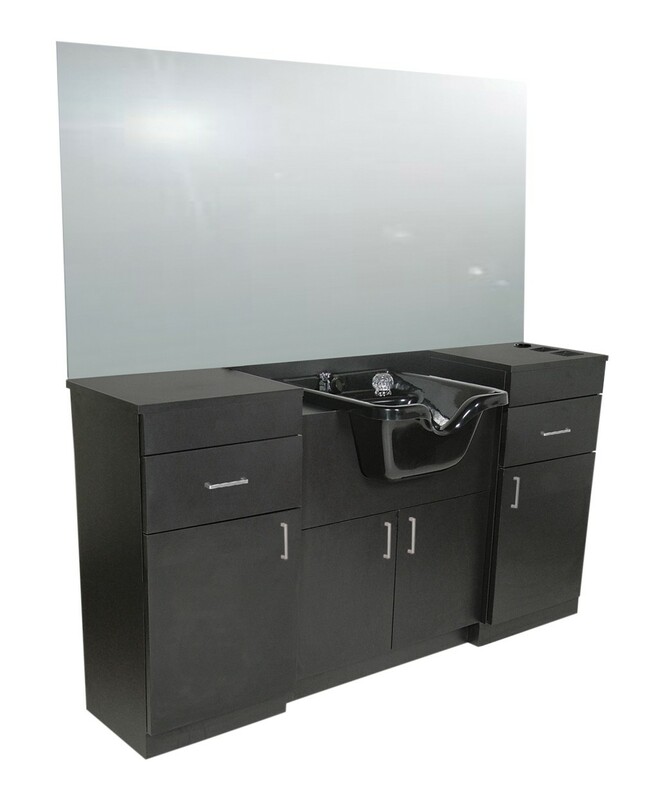 It features a durable counter-top, four drawers, storage compartment, built-in tool holder and mirror. Available in Black color only. Assembly needed. Please allow 90 days for shipping. 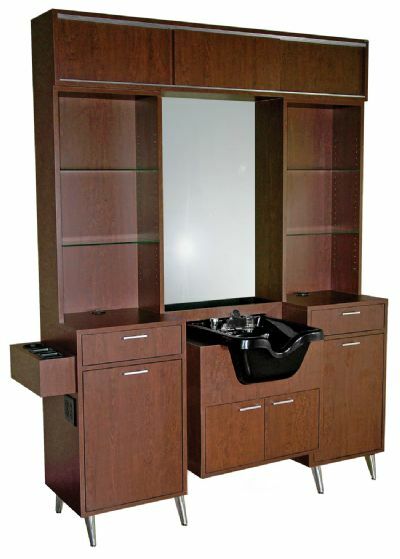 The Collins QSE 479-44 Reve sidewash station offers you the utmost quality and craftsmanship.This wet station is built with convenience in mind. It has a mirror and side mounted tool holders with space for one blow-dryer and two styling irons. It also offers a full-extension drawer and storage cabinet with shelf, a shampoo bulkhead with a recessed bottle well and a lift lid to give you a work space when not using the bowl. Bowl sold separately. Available in QSE laminate colors. 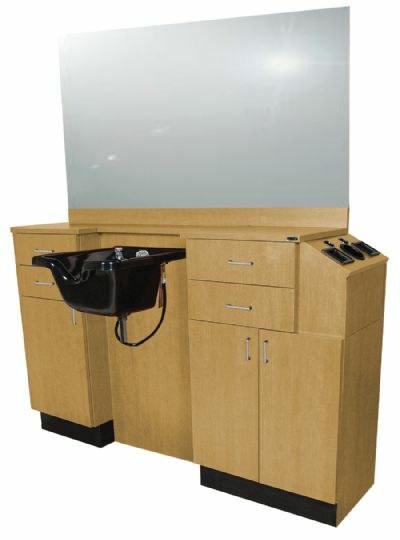 The Collins QSE 480-59 Reve sidewash station offers you the utmost quality and craftsmanship.This wet station is built with convenience in mind.It includes a mirror and side-mounted tool holders with space for one blow-dryer and two styling irons. 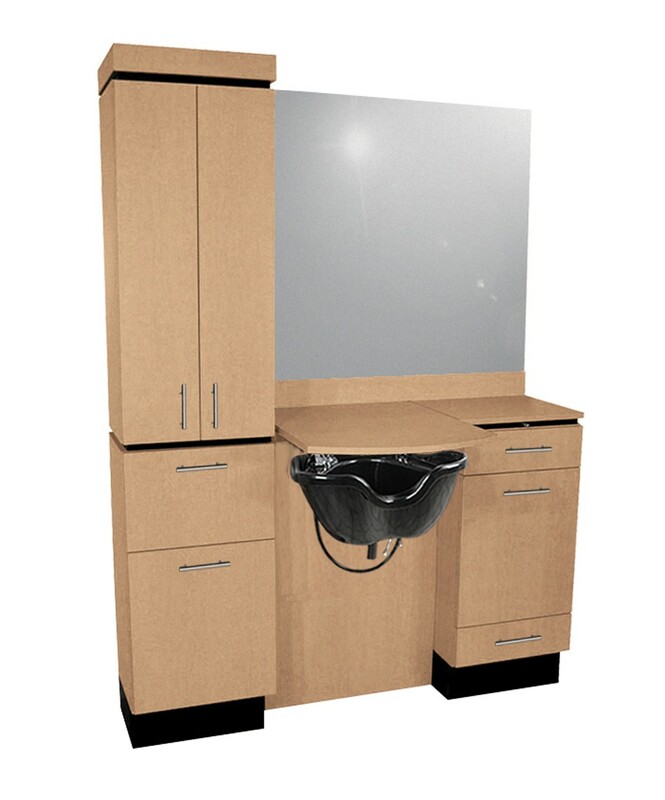 This station also includes two full extension drawers, two cabinets with shelves for additional storage, a shampoo bulkhead with a recessed bottle well and a lift lid to add an ample work area when not using shampoo bowl!. Bowl sold separately. Available in QSE laminate colors. This station is designed and built with functionality and durability in mind. It features a tool-panel with holders for a blow dryer and two styling irons, as well as a molded bottle well, backsplash and lift-lid for the shampoo bowl. It also features a 32? x 42? 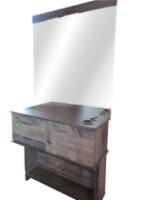 mirror with a curved-edge, one full-extension drawer and a cabinet with added shelf for extra storage. CB19 shampoo bowl is ordered separately. Available in laminate colors. This station is designed and built with functionality and durability in mind. It offers plenty of storage space with its two pull-out drawers and double-door storage cabinet with adjustable shelf. This fully equipped station includes a tapered double purse ledge and built-in tool holders with space for 1 blow dryer, 3 styling irons and a clipper pocket. It also has a 36" x 42"" wall-mounted mirror and a 6-outlet power strip. Available in laminate colors." This station is designed and built with functionality and durability in mind. This fully equipped wet booth unit comes with a tilt-out tool panel, shampoo bulkhead with bottle well, radius-front lift lid and added bread-board pull-out. It also features two pull-out drawers with contemporary drawer pulls, a backsplash and a 36? X 42? wall mounted mirror. CB19 shampoo bowl is ordered separately. Available in laminate colors. This station is designed and built with functionality and durability in mind. It features plenty of storage space with two drawers and a storage cabinet with adjustable shelf. It has a fully-equipped tool panel with spots for a blow dryer, flat iron, 2 curling irons and clipper pocket. It also features a six-outlet power strip, backsplash and shampoo well with a lift lid for when not using the bowl. CB19 shampoo bowl is ordered separately. Available in laminate colors. This station is designed and built with functionality and durability in mind. It comes with a tilt-out tool panel, shampoo bulkhead with bottle well and full size lift lid and a bread-board pull-out. It also comes with a wall mounted mirror, utility cabinet with tilt-out clean and soiled towel bins, 2 pull-out drawers and a full-width 3 inches high backsplash. CB20 shampoo bowl is ordered separately. Available in laminate colors. This station is designed and built with functionality and durability in mind. It features a tilt-out tool panel and utility cabinet with tilt-out clean and soiled towel hampers, as well as 2 pull-out drawers and shampoo bulkhead with bottle well and radius-front loft-lid over your bowl. 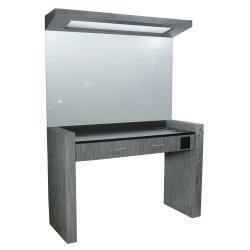 This station also provides you with a mirror, a bread-board pull out for extra work area. Shampoo bowl is ordered separately. Available in laminate colors. This station is designed and built with functionality and durability in mind drawing its inspiration from the Barber Shops in Europe. It features a round stainless steel sink with paddle-handle fixtures. It also provides plenty of storage space having a large center cabinet and two upper drawers. Its right side equipped with shear and implement drawer, utility drawer and a tool drawer that folds down in front to reveal additional tool storage! It also includes the mirror and mirror supports. Available in laminate colors. This station is designed and built with functionality and durability in mind. It offers you maximum storage space, including a cabinet with adjustable shelf, two drawers. It also has an added tower storage unit with upper storage cabinet, adjustable shelves, tilt-out clean and soiled towel bins with hamper included. This station comes with a wall-mounted mirror, tool holders for a blow dryer, flat iron, two curling iron holders, six-outlet power strip and shampoo well with lift lid. CB19 shampoo bowl is ordered separately. Available in laminate colors. This station is designed and built with functionality and durability in mind. It includes a fully-equipped tilt-out tool panel, tilt-out storage bin for both clean and soiled towels, a shampoo bulkhead with a bottle well and radius-front lift-lid, two fully-extendable drawers and a tower-style storage cabinet with two adjustable shelves for extra storage space. It also features a wall-mounted mirror, 3? backsplash and contemporary bar pulls. Shampoo bowl is ordered separately. Available in laminate colors.